Ms. Rebecca asked me a question and I realized I didn't clarify that I printed the "Porch Rules" onto a piece of "printable burlap" (found in 3 to a pack sheets at Wal-Mart), then hand stitched it to the pillow. I kinda got in the "mood" to do a few more crafts. Sewing is a craft, isn't it? I'm gonna call it that, anyway! Remember these pillows that were made from the curtain I found at the thrift store (the flowered ones)? Then, I had a light bulb moment. I figured I'd better run with it before the light burned out! and printed it right out. I had to hand stitch it over the house numbers and that's what took the longest. because I love to sit on the porch and do just that! I'll share a few more "Wise Old Owl Designs" in a later post so this one won't be so long!!! Breathtaking beautiful! I haven't been on Pinterest lately, maybe I need too, smiles. Thanks for sharing and for the smiles on this dark and rainy western NY morning-- smiles. Well, I LIKE it - even if I'm a bit confused. 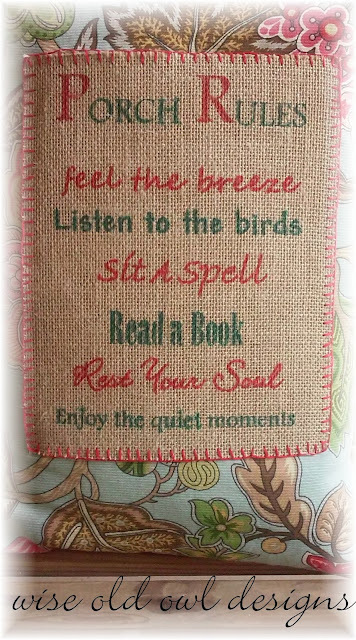 Do you print out the words on fabric? Or did you STITCH the words, too? Thanks so much for helping me realize I didn't explain well enough how I did it....I did an edit to help explain and sent you a personal e-mail!!! HOPE you have a great day!!! 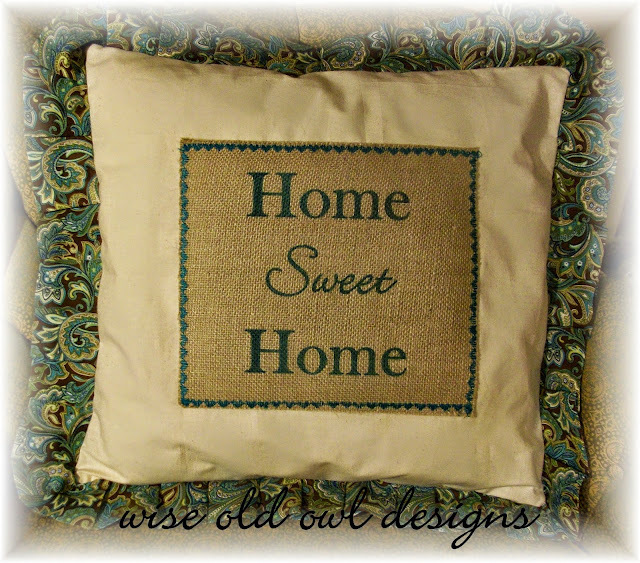 Yes, sewing is a craft...and is also an art!! It takes great skill and you seem to have mastered it. Lovely work!! What a precious thing to say....thank you so much, Ms. Terri! HOPE you have a great day! Wow, I love your projects! The porch rules are precious. As a native of Georgia, I grew up enjoying the porch. It is where my family had their daily Bible readings on summer nights. Mama and the neighbor ladies would sit on the porch early morning, shelling peas or shucking corn. I don't do many crafts these days, but I am a fan of thrift stores; you just never know what you will find! Thank you so much, Ms. Mildred. Oh, I adore our porch, too. I just wish it was bigger....and a bit more private, since we live across the street from some other houses. I do like to do my devotions out there. Yes, sweet memories!!! We have thrift store shopping in common....I LOVE them!!! HOPE you have a great day! Hi Deb! 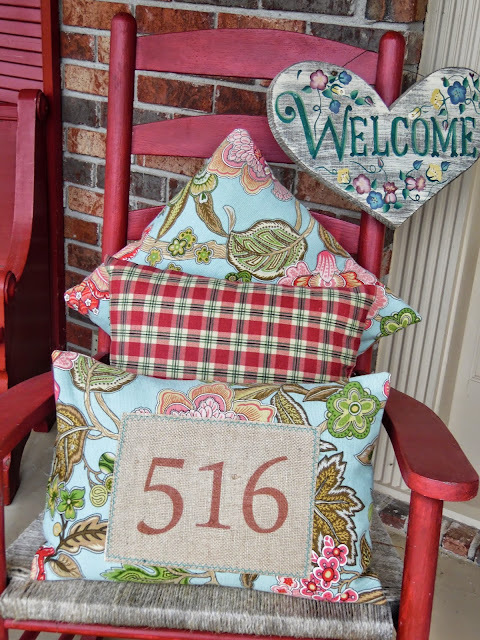 I love what you did with the porch pillows! I have a screened in porch, and I love sitting there in the breezes. Your reference to the 'light bulb' made me smile! Thank you for a little joy today. I hope you'll have time to enjoy your porch to 'rest your soul', and yes, pray. Thanks so much for stopping by, Ms. Ceil. We have a "3 seasons porch", that I love to sit on, too....but there's something about sitting in the porch swing. It reminds me of when I was a little girl and sat in the swing on the porch at my Mamaw's.....sweet memories! Awww...Ms. Debbie, I love it! Not only is your work amazing (as always), but I love the porch rules you picked! I could totally abide by them! :) Thanks so much for sharing! Thanks for ALWAYS being so kind and such an encourager. You're a blessing.